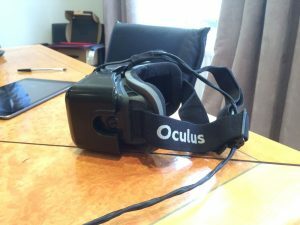 Robson Brown – Have you been on a tour of Oculus Rift yet? Have you been on a tour of Oculus Rift yet? Great excitement today at Robson Brown as we took delivery of our new Oculus Rift kit that has been used in development by our sister team at Think VR. We got to experience multi-story overhead views of Wembley stadium, luscious and verdant housing estates and everything from Matisse to Jackson Pollock paintings hanging on the living room walls of stunning new build houses. The technology allows for some quite incredible and remarkably realistic immersive stimuli, like office or home walk-throughs, so that you really can feel that you are part of that environment. OK, you look something of a dork wearing the headset, but it’s not augmented reality kit so you won’t be asked to wear it to go and buy the week’s groceries in Tesco. A real eye opener (if you’ll excuse the pun) of the technology is that you need absolutely no hand eye co-ordination for it work seamlessly first time. You move through environments by briefly holding your gaze on a dot in the background. Easy peasy. No aiming, no hovering your finger. You simply look at the dot and, hey presto, you’re in a new location. If you fancy a gander you’ve got a couple of weeks to drop into Summerhill Terrace before it goes walkabout somewhere to one of our other offices. Trust us. It’s blindingly brilliant. Well, not literally.